GOOD GOLLY!!! 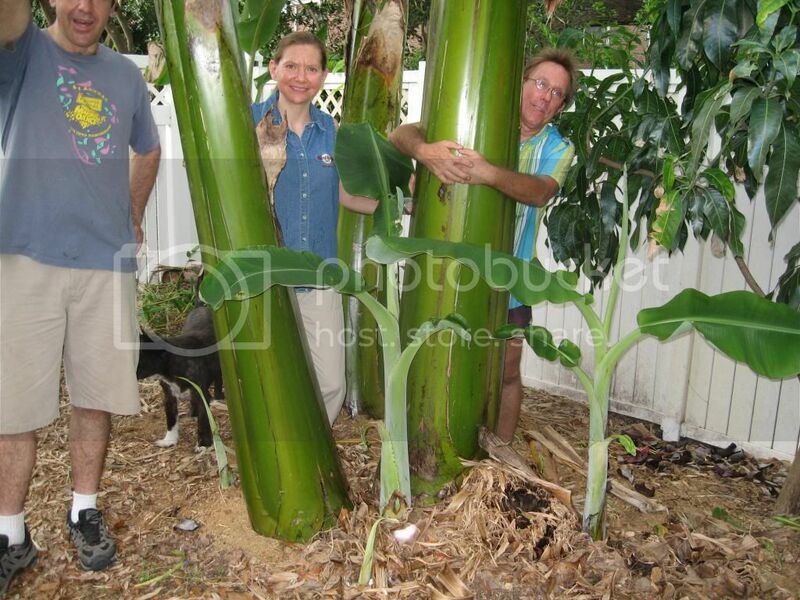 Perhaps I missed it... what on earth type of Banana plant is THAT?!? Lol....Saba...to put this in perspective..my friend in the blue shirt is 6'4"
LOL, man I LOVE those pics! I can't help but smile and laugh to myself as I scroll through them. I am just flabbergasted at their awesomeness. Rmplmnz, you've truly got a Saba-sized green thumb. Much respect! Location: WSW Houston, TX by 45 min. Okay... Big Daddy's a Saba... what is typical of the taste of those, which is my primary concern? Can you describe flavor/texture? Secondly, what's production like (do you have to wait awhile for them to mature for production)? If you could plant only??? I am a big fan of Hua Moa. I've figured out when to use it for the various plantain recipes that I cook on a regular basis. Mysore is the best small banana that I have tasted, Nam Wah is good but I'd rather have a mysore. Mysore also doesn't have problems with Panama disease. Goldfinger is a great variety, it taste great, and it's resistant to disease. 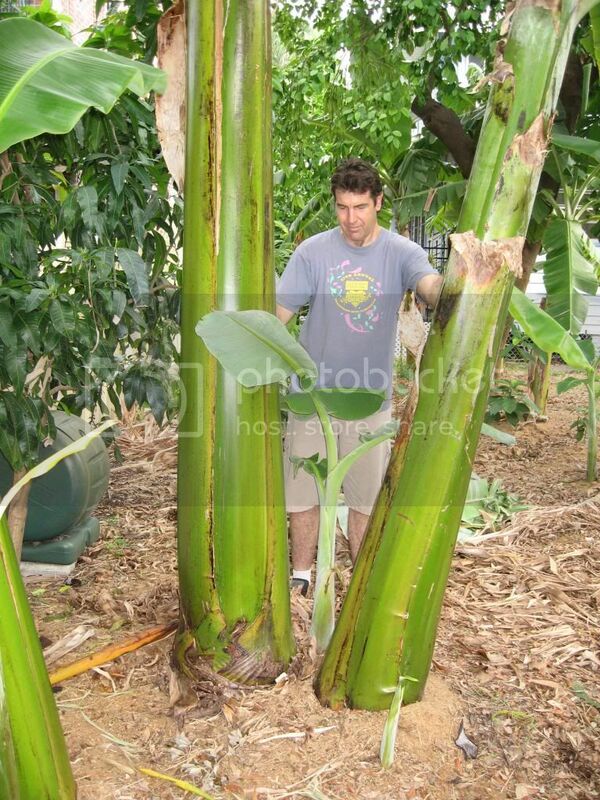 Awesome Nicolas..I agree on Hua Moa..first banana plant I ever acquired (1993) from Going Bananas..based on Mrs. Lessard's (Bill Lessard sold GB to Don & Katie) recommendation. * Awesome when microwaved for 60 seconds or so and placed on frozen yogurt (or Coconut Ice Cream for the Vegans). Thanks for the information. Mysore is on my list of three and so is a dwarf Namwah... but don't know if I'd be doubling up on varieties so similar that I would lose having any variety -as I only have places for 3 types. The good news is there is a wealth of information on the Org site. 1) Can you plant very cold sensitive varieties?? 2)My top bananas rarely make any one else's top list...I love super super hott food (I ate 10 Munchie's 420 cafe wings in 3 1/2 minutes...see the only Hott challenge Adam failed in Man vs. Food)..yep my picture is in the Hall of Fame.. So I do not like sweet foods....I like a dense banana Saba, Hua Moa, Fehi, Ele Ele...and occasionally a sweet banana..like a "perfectly" ripe Ice Cream (no better banana on the planet).. Seriously fun stuff, this thread needs more pics and a sticky! "Ph'nglui musaglw'nanna Funkthulhu R'Omahaea wgah'basjoo fhtagn"
"In his house at Omaha, dread Funkthulhu plants bananas." good question. I want one. Previous Thread: Is this Moko or Panama diesease?